Cotton thread is made of separate strands of spun cotton fibers which are then spun together to form the final thread. The separate strands are called yarns. 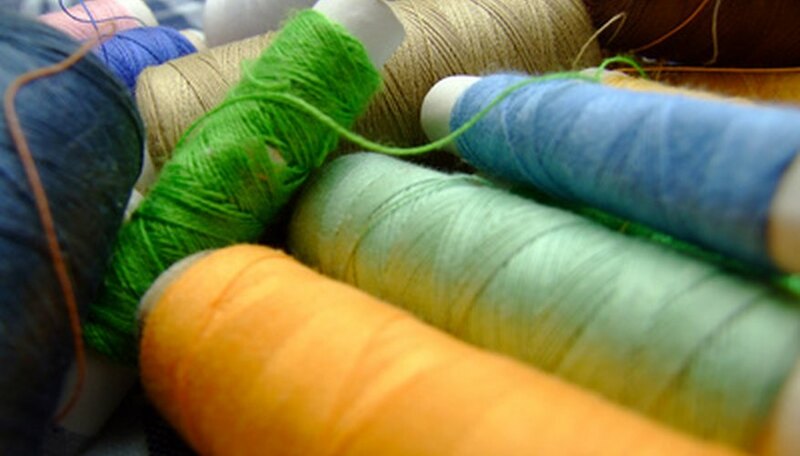 The yarns are the determining factor for finding the weight of a cotton thread. The actual weight of a cotton thread denotes the thickness and strength of the thread which then determines the best use for the thread. Thread is made of either two or three yarns which vary in thickness depending on the final thread being spun. A very fine thread will consist of two finely spun yarns. Heavier thread consists of three yarns that are relatively thick to begin with. Thread spools are labeled with numbers which denote the weight of the thread. The first number will give the thread weight and the second will tell the number of yarns in the thread. For example a #50/3 marking will mean a weight of #50 and is composed of three yarns. Generally speaking the higher the weight number, the finer the thread. These labels are not internationally standardized. Read the label on your spool of thread. Common cotton sewing thread will usually have a label that reads #50/3. This means that your thread will be a moderate weight thread made up of three yarns that have been spun together to form the thread. This thread will be fairly strong and is easily threaded on any sewing machine. It will work well for hand sewing, as well as for making or repairing garments. Labeling of #100/2 denotes a thread that is very fine and excellent for hand applique. They are not very strong because they are so fine. The thread consists of two yarns which are very finely spun. These two yarns are then spun together to form the thread. A label which reads # 30/3 is a heavy thread. Thread of this kind consists of three heavy yarns spun together to form the thread. This type of thread often comes with a special finish to it called a glace finish. This helps to keep the thread from knotting and tangling. Threads of #30/3 weight are used for quilting since you need the heavier weight to hold up to the stress of the quilt's weight. Thread comes in a variety of weights. The best way to tell if you have the right thread for a project is to read the label then unspool some of the thread and check the thickness by hand.